Welcome to Marvel Strike Force Heroes page. This is the full description of MSF Scientist Supreme stats, skills, and abilities. Scientist Supreme is an expensive A.I.M. Supporter who works best with A.I.M. team. Her first skill delivers medium damage to the target and applies 2 random negative effects. Her second skill converts 3 negative effects from all allies into positive. Scientist Supreme ultimate heals her and all allies for a medium amount of health and applies one to three negative effects to both allies and enemies. She also grants a chance to Revive any fallen ally at the start of each turn. Scientist Supreme works best with A.I.M. minions because they have skills which applies negative effects to themselves and Scientist Supreme can flip those effects into positive. Scientist Supreme is very expensive and her price is 100 shards obtainable through Mega Orbs, Premium Orbs, and 2-9 Cosmic campaign mission. Villain, Global, Tech, Support, A.I.M. What are Scientist Supreme’s stats? 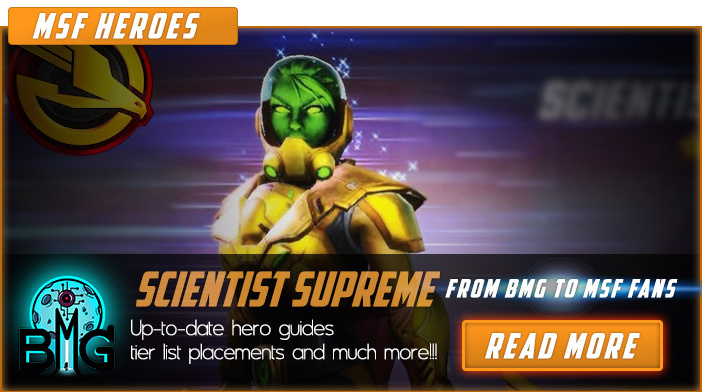 We hope that you enjoyed the description of MSF Hero Scientist Supreme. For detailed information about other MSF Characters check our MSF Heroes page.